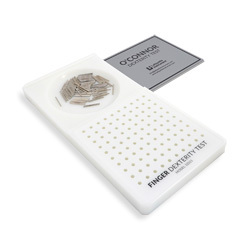 The O'Connor Finger Dexterity Test requires hand placement of 3 pins per hole. This test has been used successfully as a predictor for rapid manipulation of small objects, as in assembly line work. It has also been found useful in predicting success for instrument work, such as the assembling of armatures, miniature parts of clocks and watches, rapid hand and eye work, filling vials, and small lathe work.